Thanks Peter for the interview & pic above. Thank you & a fan review! The past 4 gigs were again a blast.. Leeds, Newcastle, Carlisle & Grimsby. Thank you so much to those of you at each of these shows, we had a brilliant time & you seemed to as well! Thanks also to our special guests on these 4 shows.. Babylon Fire. You guys rocked & as always it was a real pleasure to be following you onto the stage, knowing that the audience was already in the mood! \m/ A word also for our good friend Mick Ball who at the post-gig party in Grimsby on Sunday managed to break his foot & toe, despite manfully lasting until today to actually go to hospital to get the injuries looked at! A word also for our excellent crew.. drum tech Sager & guitar tech Crazy Mike. You both did a cracking job, were great fun on the tour dates & we will miss you in Derby on Friday at the Old Bell. Thankfully you'll return to look after us at the Helloween Ball on Saturday. Phewwwwww! Wow! What an amazing band! This was the first time Id ever seen this 3 piece live, as support to Y&T. The sound they have is incredible and they play brilliantly up on that stage. Not a note out of tune and full-on raw n' heavy. The singer has a great voice and is visually stunning to watch. His guitar playing is amazing, I looked round to witness everyone in the venue (including the staff) watch his awesome solo's. But that's not all. They have the most catchiest songs to back it up! After this gig I had 'I See Red' and 'Nemesis' stuck in my mind. I thoroughly enjoyed their set and was buzzing to know I have seen this band before they get huge, which on this performance is a certainty. Having seen this excellent band once before it was great to see what response they would get from a group of friends that came with me. They agreed, like me, that we'd witnessed a band play who are sure to get massive. The crowd took to them because they have it all. Great sound, great stage presence, brilliant songs, stunning guitar solo's. The bassist is active too and like the singer, great to watch. The drummer is a real character too, walking on stage hands aloft shouting out loud, stirring up the crowd as he enters the stage first.He pulls it off wonderfully too!!!! The headline act Y&T even said that in 2 years they will be probably supporting them!!! The set they played was brilliant. Starting with the catchy 'I See Red' and ending with 'Death By Lightning'. The crowd gave them a well deserved applause and totally loved this band. At each of these shows we play between 60 & 90 minute sets. "full on, quality traditional British metal.. highly gifted guitarist, ably supported by a rock solid rhythm section.. reminiscent of early Maiden in places.. illustrates why this band have a bright future ahead of them". Y&T.... there are no words! Yes, there are no words that properly sum up our tour dates with Y&T but we'll do our best! Massive thanks to the Y&T band first of all.... frontman/lead vocalist/lead guitarist Dave, guitarist/backing vocalist John, drummer/backing vocalist Mike & bassist/backing vocalist Brad (respect & best wishes also to regular bassist Phil who is currently undergoing treatment for cancer, our hearts are also with you Phil & hope that one day our paths will cross). 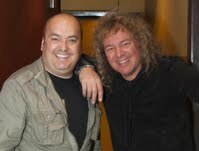 Big thanks also to Y&T's manager Jill & crew members Rolf, Jon & Steve. It was actually Steve that recommended us to Y&T (having seen us at Bristol Academy on the Michael Schenker tour) & we're forever in his debt for that. You are all very very cool people & we salute you! Massive thanks also to our fans old & new. The support from our existing fans was brilliant, & the new fans & friends gained on this tour has been fantastic too. The press coverage on this tour has been cool also.... see the recent live reviews so far.... for example by Komodo Rock, Bacon Music, Rockgig Reviews, Mayfair Mallzine. There's a lot of photographs out there from the tour too & we've not yet had chance to catch up with those. Big thanks nevertheless to all photographers, those we have managed to see so far have been ace. The party at the end of the London show was immense, crazy, emotional & very very drunken. Chris had managed to get himself invited on stage with Y&T towards the end of their set-closer "Forever" & that set the tone for an emotionally-charged ending to this experienec we'll never forget. After that it was back to Y&T's hotel for the madness induced by our good friends Jagermeister, JD & assorted brands of rum! Good times! \m/ Thanks again to Komodo Rock & Rockpages! "In an act of old school hard labour Fury UK unleash their 3rd album 'A Way of Life' when a lot of fans have only recently digested 'VR'. This not only succeeds in keeping the momentum rolling but shows how quickly the band have managed to raise their game since their debut a mere four years before". Here's the details for the headline shows in October, together with ticketlinks and/or phone numbers to buy tickets for these shows. (We regret to advise that the Mosh4dosh event planned at Victoria Hall, Hanley for 31st October has been cancelled. We have no details about the reasons for this but in any case we apologise to the many people who we know had been planning to attend this show). Newcastle O2 Academy with Y&T, by Komodo Rock.. "a superb job. 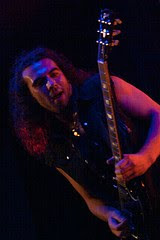 Nemesis, Call To Arms & Death By Lightning stood out in a bold set of straight up metal". Nottingham Rock City gig with Y&T, by Bacon Music.. "hot on the heels of the release of excellent new album, ‘A Way of Life’. 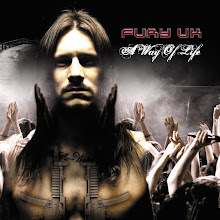 Fast becoming known for their explosive live performances, Fury UK duly delivered a blistering set". 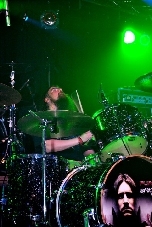 Bradford Rio's gig, by Rockgig Reviews. "Plenty of potential to go further". We've received a stunning live review by Mayfair Mallzine from the Newcastle O2 Academy show on October 8th.... "we had the pleasure of once more seeing what we consider as Britain’s premier Heavy Metal band"
Many thanks for these excellent words about the band & our performance. Massive thanks to everyone that's been to the shows so far on this tour.... that's Manchester, Bradford, Glasgow, Newcastle, Nottingham. We've had a totally brilliant time. Once again here's the ticketlinks for the remaining shows on the Y&T leg of our tour & please watch for the early stage times at Birmingham & London.. at both of these shows we're ONSTAGE at 6.45pm! 2 dates gone & so enjoyable so far. Manchester & Bradford rocked, massive thanks to everyone who came along, packed houses & a sell-out at Manchester. Y&T have been really cool with us, great guys & we've been looked after brilliantly.. AND they are an awesome band without doubt. The aftershow party in Manchester was cool too & we sunk a couple of cold ones along the way! Our setlist so far has been I See Red, Fall From Grace, Saviour, Nemesis, Call To Arms, Death By Lightning.... although missing Call To Arms in Bradford.